Scientific Name: Order Orthoptera, family Gryllidae, Acheta spp. Identification: Adults are dark brown, gray, or black with long antennae. Biology and Life Cycle: Incomplete metamorphosis. Male crickets are the noisemakers. Like to live and breed in warm protected places. Eggs are laid in moist soil. Hibernate in the nymph stage and have one to three generations per year. Feed at night on insects and plants. Feeding Habits: Eat several kinds of plants, especially long sprouts. Indoors they can damage wool, cotton, silk, synthetic fabrics, carpets, rugs, and furs. They also like food scraps, leather and rubber, beans, cucumbers, melons, squash, and tomatoes. Economic Importance: Keep people awake at night (although Malcolm says it makes him sleep better). Natural Control: Birds and naturally occurring microbes. Organic Control: Nosema locustae products; diatomaceous earth products. Boric acid products that contain an attractant bait are also effective indoors. 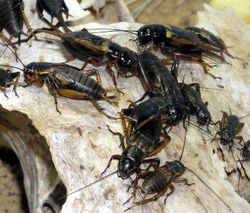 Insight: Crickets are commonly grown for fish bait and food for insectivorous pets. Cricket manure is an excellent organic fertilizer. 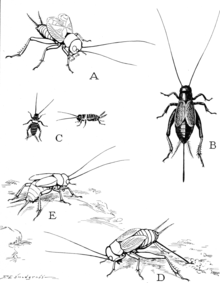 Mole crickets are less common, live in the ground, and eat plants roots. See Mole Cricket.